SAN MARCOS, Texas — During a Texas State men's basketball practice you can hear 6th year head coach, Danny Kaspar barking out things like, "You got it, alright let's go!" Since 1991, Danny Kaspar has won 556 games as a head coach. 17-times his teams has won 20 plus games. The Bobcats are just two wins away from reaching that 20-win plateau in Kaspar's 6th season at Texas State. "It's been a enjoyable year from the standpoint people are not expecting us to do this," said Kaspar. Instead, Kaspar's Bobcats share the lead in the Sun Belt Conference. "This is a great team and the run we're putting on is a lot of fun," said Alex Peacock, Texas State forward. RELATED: Texas State's attempt at overcoming a losing skid: a surprise dodge ball match? 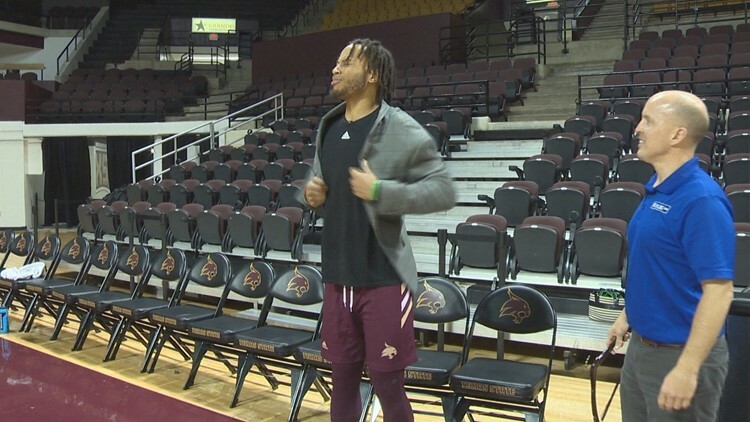 A fun ride which could realistically end up in the Big Dance, something this program hasn't experienced since 1997, clearly seen on a banner hanging from the rafters of Strahan Coliseum. "I look at those banners every day," said Peacock. A banner season, perhaps for Kaspar in the newly renovated Strahan Coliseum. A season in which fans and players have embraced Kaspar's trademark mustache and they keep an eye on his game day sport coat. A sport coat which Kaspar removes during a game. 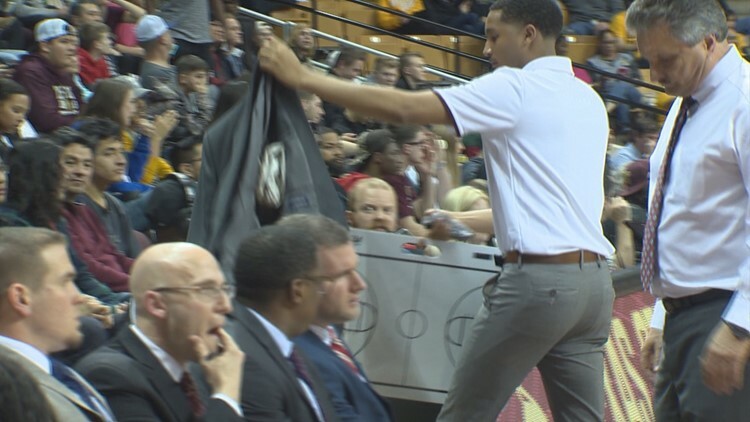 The Bobcats have an over/under in the amount of time their coach removes the sport coat. The first media timeout is four minutes into a game. "Sometimes, depending on who we're playing, we'll make a wager if he puts it back on," said Peacock. Which leads to the question, what prompts Kaspar's in-game removal of his sport coat? "That depends on the intensity of the game," said Kaspar. Alex Peacock jokingly impersonated his head coach with a borrowed sport coat at a recent practice. Peacock stomped his left foot then pulled the jacket off quickly and slammed it on the chair Kaspar uses during a game. Kaspar was amused, but disagreed with the jacket removal portrayal. "I respect my clothes too much to take them off like that," said Kaspar. What exactly would cause a not so nice and neat jacket removal? "That would have to be a call that would cost us the game for sure. Much like the New Orleans Saints got robbed," said Kaspar. Kaspar's jacket has a Twitter handle and is part of a theme for Saturday's game. Fans are encouraged to wear a fake mustache and sport coats to Saturday's game against Coastal Carolina. Tip off at Strahan Coliseum in San Marcos is 4:00 PM.